1 Bedroom | 1 Bathroom | Sleeps 2 | Walk Everywhere from Jones St! Get the utmost in privacy and amenities by booking Savannah vacation homes by Southern Belle for your next visit to this historic city. Our vacation rentals Savannah GA feature all the top amenities you'd expect from a hotel as well as privacy and space no matter what size your party. We have Savannah vacation homes for both small and large parties, and the Garden on Jones property is one to check out if you're looking for the former. This 875 square foot apartment is bright and cozy with recent renovations. It can sleep a total of two guests and is located on historic and beautiful Jones Street. We strive to make all of our vacation rentals Savannah GA unique and comfortable, and this one is no exception. The living room features a gorgeous brick facade, track lighting, and comfortable seating. A small dining area for two is immediately off the full gourmet kitchen. The kitchen itself features full-size appliances and plenty of counter space for creating delicious home-cooked meals. The one bedroom is as light and bright as the rest of the apartment and includes a queen bed, bookshelf and dresser. This apartment also includes a washer and dryer for more convenient longer stays. Other amenities include wireless internet, a TV, ironing board, workspace for a laptop, drip coffee maker and other necessities. Savannah has a huge variety of attractions and things to do. Staying in Savannah vacation homes puts you right in the center of the action with excellent locations in historic neighborhoods. The biggest draw in Savannah is undoubtedly its storied history. From museums to historic houses, to cemeteries, old forts and much more, Savannah is heaven for the history lover. It can be difficult to know where to start in exploring the history of this city, so it's helpful to know the different museums in different categories. For military history, you can't miss with the Webb Military Museum, which houses an extensive collection of artifacts from the Civil War and later. For transportation buffs, check out the Ships of the Sea Maritime Museum and the Georgia State Railroad Museum. - Mercer-Williams House was featured in the "Midnight in the Garden of Good and Evil"
Another fun activity when staying at vacation rentals Savannah GA is to take the short drive east to find Tybee Island. This charming little island is well known as Savannah's Beach, and it has both Atlantic-facing and river beaches to choose from. Beachcombing and water activities are popular pastimes, but other options include visiting the Tybee Lighthouse to the north and the Marine Science Center on the south end. There are also a number of delicious waterfront restaurants such as A-J's Dockside and the North Beach Bar and Grill. 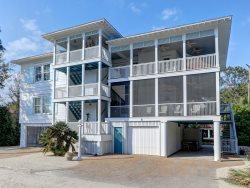 Tybee Island is the perfect vacation within a vacation when you stay at Savannah vacation rentals. Come see what makes Southern Belle's Savannah vacation rentals the talk of the town when you book one of our properties today. It's quick and easy to find your favorite on our site and book online or give us a call. All team members contacted me in a timely and friendly manner. The location of this property was wonderful, and it is easily one of the nicest kept property I've stayed in.